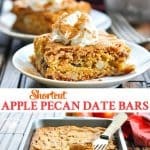 Shortcut Apple Pecan Date Bars are an easy dessert recipe that's ready for the oven in 10 minutes! 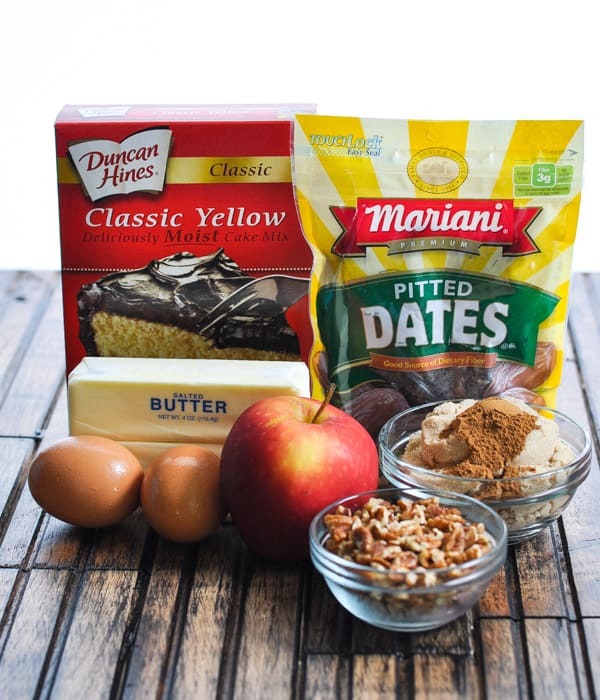 There’s a secret shortcut to get these Apple Pecan Date Bars ready for the oven in just 10 minutes! The ooey, gooey, chewy, and buttery treats are an easy dessert recipe that’s perfect for any fall celebration. Not a fall goes by that I don’t bake at least one batch of these incredible date bars. They seem so simple, but they taste SO good — especially when you top them with whipped cream or vanilla ice cream and caramel syrup! 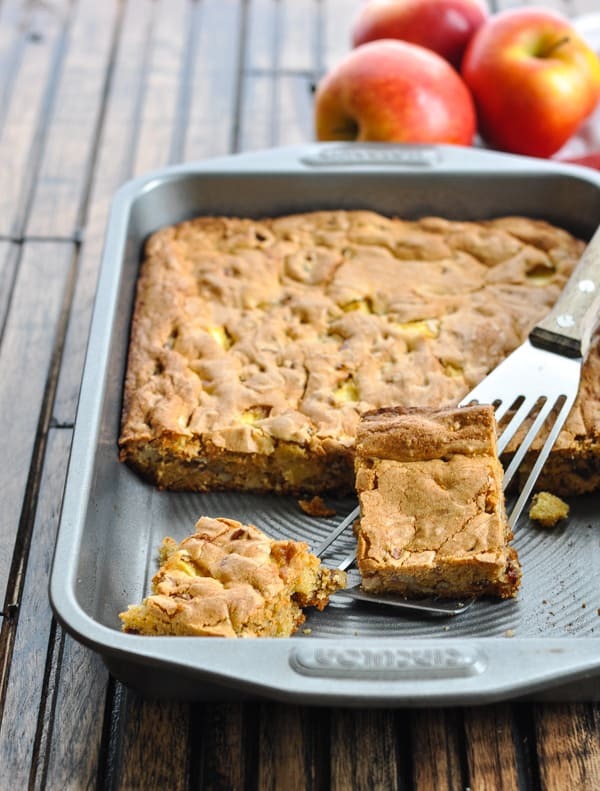 Think of these little goodies as apple cinnamon blondies! Sometimes you just need a quick and easy recipe that gets you in and out of the kitchen fast. 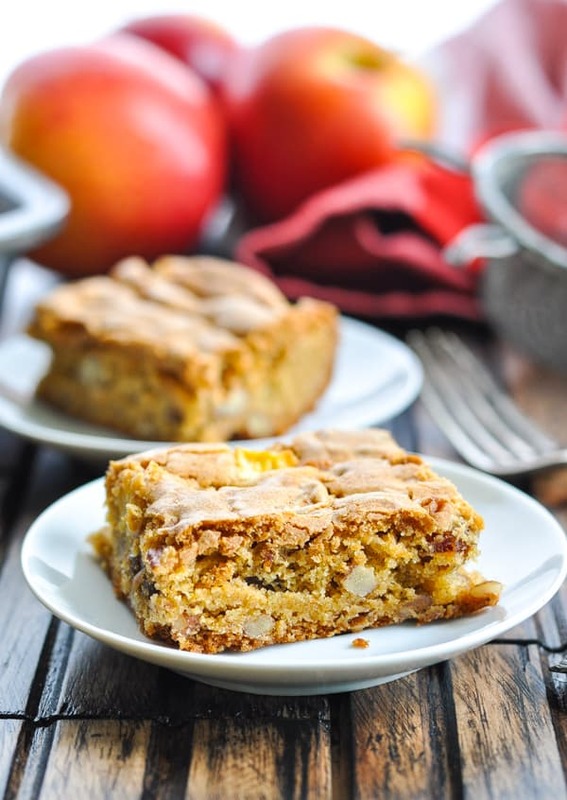 These Apple Pecan Date Bars are just the solution! My secret? They start with a box of yellow cake mix! 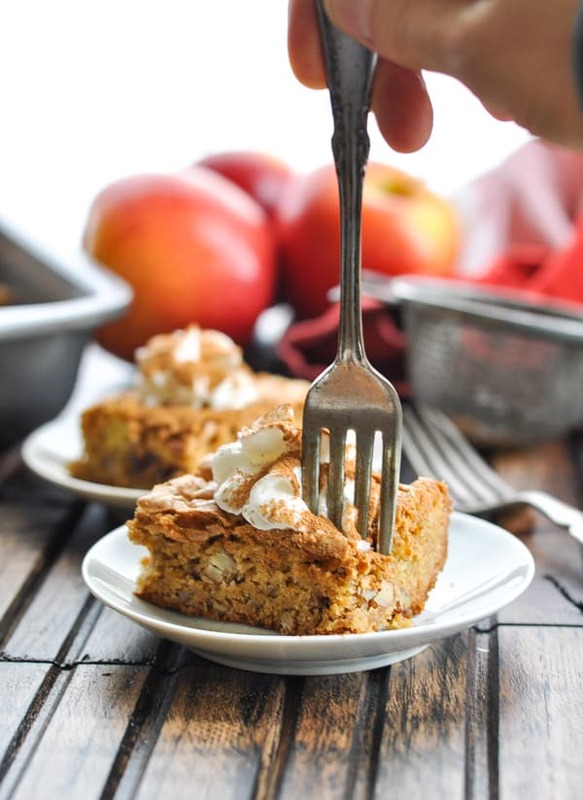 Throw in a few more delicious ingredients like some warm cinnamon, rich butter, brown sugar, apples, dates, and pecans and you’ve got all of the classic tastes of the season. 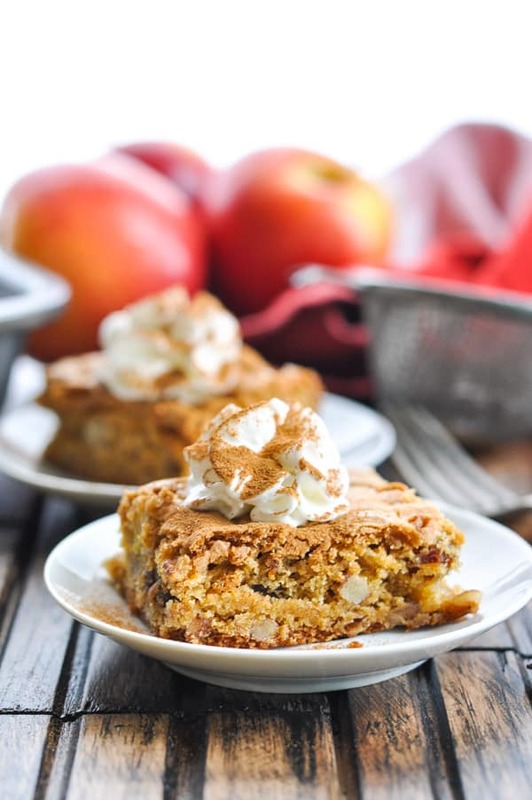 In a large bowl, whisk together dry cake mix, brown sugar, and apple pie spice (or cinnamon). I like to use my fingers to break up the largest clumps of brown sugar, but you don’t need to worry about any smaller clumps. Next, add the melted butter and eggs and beat on medium speed for 2 minutes. 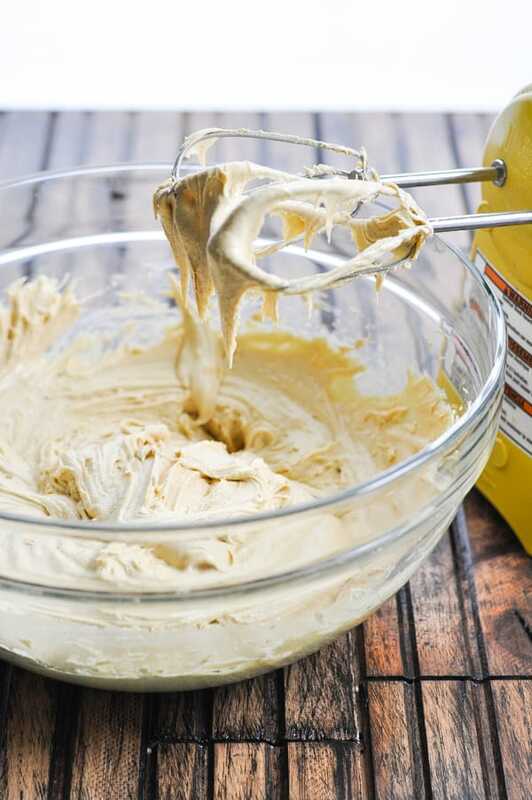 The batter should be light, fluffy, and thick! 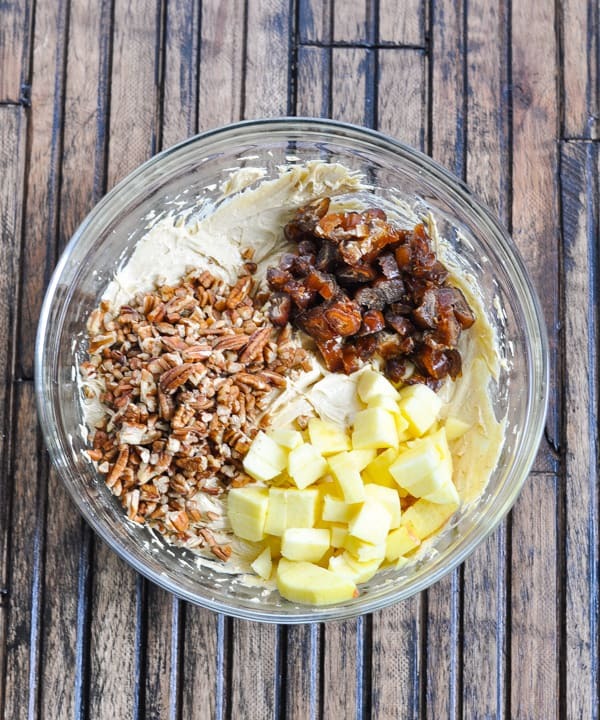 Finally, stir in the apples, dates, and pecans until completely combined. Spread the batter in a large baking dish and about 30 minutes later you’ll have these rich, decadent date bars! They’re warm, chewy and buttery, with sweet and tender little bits of apple and dates all throughout. Top them with a dollop of whipped cream or a scoop of vanilla ice cream and a drizzle of caramel syrup. Your friends and family will be incredibly impressed…and they’ll never guess your secret shortcut! Use your fingers to break up any large chunks of brown sugar when combining the dry ingredients, but don’t worry about any smaller clumps. Pull the bars out of the oven when they’re just golden brown. They should still be a little soft in the middle, since they will firm up a bit as they cool. This yields a chewy, gooey date bar! 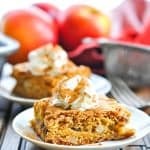 Eat them like blondies with your fingers, or garnish the bars with whipped cream or vanilla ice cream for an even more decadent treat! This easy date bar recipe freezes really well when wrapped tightly, so they’re a great make-ahead option. Grease a 13-in x 9-in baking pan. 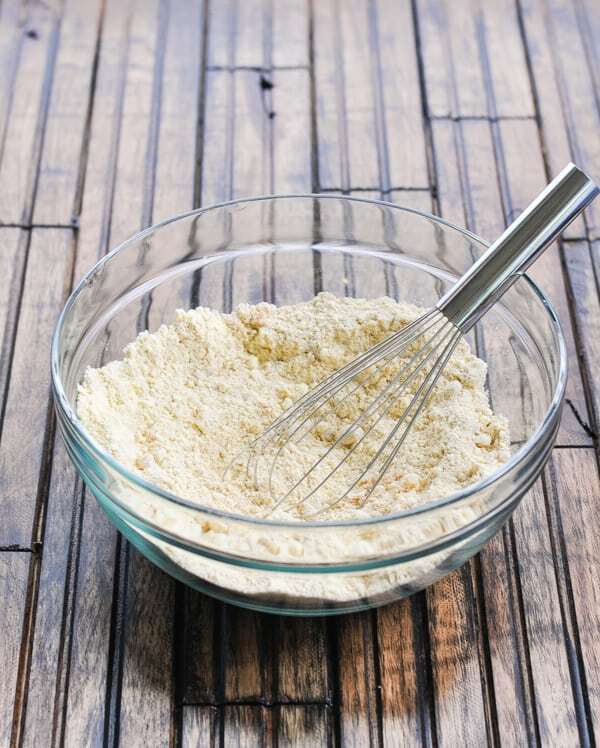 In large mixing bowl, whisk together cake mix, brown sugar and cinnamon. Add melted butter and eggs; beat on medium speed for 2 minutes. Stir in apple, dates and pecans. Spread evenly in prepared pan. Bake for 30-35 minutes, or just until golden brown. Cool completely on a wire rack before cutting. Use your fingers to break up any large chunks of brown sugar when combining the dry ingredients, but don't worry about any smaller clumps. Pull the bars out of the oven when they're just golden brown. They should still be a little soft in the middle, since they will firm up a bit as they cool. This yields a chewy, gooey date bar! This easy date bar recipe freezes really well when wrapped tightly, so they're a great make-ahead option. This post was originally published in October, 2013. It was updated in October, 2018. I love dates SO much! I would never think to pair them with apple though. These sound incredible and I can’t wait to try out this recipe! Thanks, Niki! Try them — you will LOVE them!!! All of these desserts look amazing. If you have some leftovers can I have them? I LOVE dates, probably the most underrated cookie ingredient, ever! Thanks so much for sharing at the Pinworthy Project Party. I’ll be featuring this on Thursday morning, so stop by for a button! I had criticized a previous recipe of yours that I tried. But not this time. Stumbled on this recently and had to try it. Fantastic. I sprinkled some turbanado sugar on top before baking, which gave it a nice crunch without adding a lot more sweetness (it’s plenty sweet). I can’t say enough about how good this turned out. A perfect combination of flavors. It can work for dessert, with coffee in the morning or as a snack. Great for when family visits. I’ll be making this again. I also love dates. thanks for sharing these recipeis. Yummy. This is looking delicious.